Electronic Repair Centre: We service all computer, audio-visual and related electronic equipment. For I.T. related repair, your school SST must evaluate the computer, Smartboard or printer first. They will then log it into eBASE and send it through the board courier system. For audio-visual equipment, any staff member can fill out a repair form and send it in though the courier. If your school needs repair forms, email Sara.Weaver@publicboard.ca. Note: If a repair is related to a special needs student, please indicate on the repair form. Special Education needs will be given priority. IMPORTANT: PLEASE DO NOT TRY TO REPAIR ANY EQUIPMENT YOURSELF. IT IS HARDER FOR US TO FIX, AND IT CAN BE DANGEROUS. On-Site Repair: To request on-site service, please click the link below, fill out the fields and press submit. You can also request service through eBase. 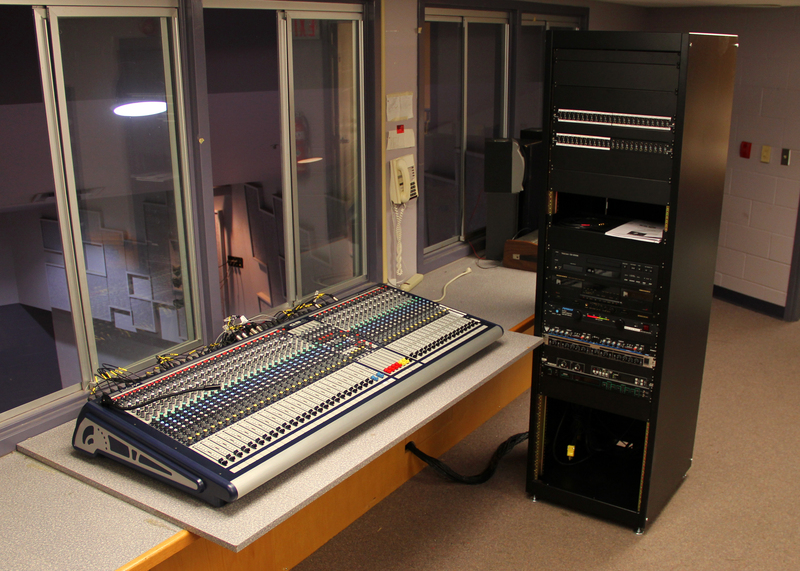 Smartboards, all electrical plugs, TV mounting, a/v cart assembly, stage lighting, gym sound systems, stage curtain quotes/installation/repair, iPad stations, electric screen installation are among the many items we service and maintain. Consulting, Purchasing, Installation and Maintenance: To ensure that you are getting the most value for your money, the Electronic Repair Department can provide recommendations on sound systems, stage lighting, proper microphones, data projectors and screens for large room applications, board room or studio configuration and stage curtain measuring, proper rigging and installation. See BUS:2009/10:120 Stage Sound/Lighting & Multi-media Requirements. We have not only saved schools thousands of dollars, but ensure that quality equipment is purchased. See policy and procedure AP-PL-01 APPROVAL FOR ALTERATIONS TO SCHOOL BUILDING and/or GROUNDS form must be submitted to Facility Services and approved before any media equipment is mounted to the wall or ceiling. Disposal of Electronic Equipment: TVs, VCR/DVD units, audio components/cables, av/computer carts, printers, computers must be evaluated by the Electronic Repair Department before being disposed of for spare parts or uses in other schools as per the Board's policy and procedures. Once it's designated for permanent retirement, it will be properly recycled by a certified handler. For over 10 years, our Board has partnered with the local charity, Computers For Kids. To have retired equipment picked up, email Dwayne.Teskey@publicboard.ca. A/V Cables: We have various types of cables and adapters in stock. We can also make or repair most audio-visual cables. Email us for details. Television Purchasing: It is very important to contact the ERC before purchasing a television. Brand, price, proper size, option needs and mounting are a few things you need to consider. If you plan to mount it, only Board approved, heavy duty mounts are to be used, no substitutes will be accepted. If you plan on using an existing cart, we have special mounts for that as well. Email us to get the process started. Bulbs: Scroll to the bottom of the page to download a copy and scan it to the Media Centre. Paper Cutter Sharpening and Repair: We now sharpen and repair all paper cutters. Summer Maintenance: Our staff clean and redress any equipment they can access during the summer. If you have Smartboards, data-projectors or electrical plugs that need repair, please gather all equipment in one room. Notify us, and will will notify Facility Services to leave that room alone until we are through. Audio Visual Staging/Support: The ERC provides audio-visual equipment and technical support for meetings, conferences and special events throughout the Windsor/Essex area. As a full service department, we can supply requests for virtually any situation regardless of the technical requirements. This service alone saves the system close to $100 000 yearly. A single large event at a conference centre like Caesars, savings have been in the $40 000 to $60 000 range alone. To book audio/visual support for a system wide event please fill out this request form.